Brothers Waylond and Morlund are numbats . . . marsupials indigenous to western Australia. The two have long been estranged since a tragic accident which tore them apart as young boys. But now it’s time for the next Guardian in line to be announced and the brothers find themselves in a classic struggle of wanting the same thing knowing that only can have it. 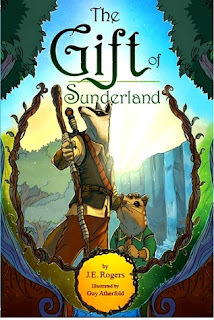 Young readers are sure to love these fanciful characters which are subject to daring adventures. They have relatable problems including family rifts, battles of good and evil, and near death experiences, including a thrilling journey into a volcanic mountain. The book has multiple heroes and genuine personalities we all can recognize. Author J.E. Rogers paints a vivid picture with a little magic of her own as she conjures delightfully colorful characters and engaging scenarios. Illustrations by Guy Atherfold are marvelous and help to bring these enchanting characters to life. Provided at the end of the book is an educational introduction to Australian flora and fauna (including the extinct Thylacine). The descriptions and pictures are a fantastic addition to this book which is both enlightening and entertaining. We loved the messages tucked neatly within this fantasy fiction adventure: Everyone has problems. No one is perfect . . . but everyone also has their own strengths. And above all, don’t let having made a mistake stop you from moving forward to achieve your dreams.